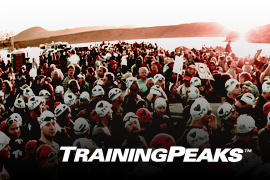 TAMPA, Fla. (May 1, 2013) – IRONMAN is proud to announce TrainingPeaks as the Official Training Software of IRONMAN®. For the next four years, TrainingPeaks will offer its complete web, desktop and mobile tracking, analyzing and planning system to all IRONMAN triathlon participants to help them achieve their goals – whether it’s to complete their first triathlon, or qualify for the IRONMAN® World Championship. Through the sponsorship, all IRONMAN, IRONMAN 70.3® and 5150™ registrants will have the option to get a free basic TrainingPeaks account where they can log their workouts and perform analysis of their training data. TrainingPeaks will also perform race-day data analysis from some of the top IRONMAN pros for major events, including the IRONMAN World Championship, IRONMAN Asia-Pacific Championship and IRONMAN 70.3 World Championship. Dirk Friel, co-founder and Chief Evangelist at TrainingPeaks said, “We want to use power, heart rate and GPS data from the pros and other age groupers to show all athletes how to race successfully for their own events – as well as educate the general public about the sport.” TrainingPeaks analyses will also be featured on IRONMAN Live webcasts. TrainingPeaks and IRONMAN are officially launching the sponsorship at the IRONMAN 70.3 St. George triathlon on Saturday, May 4, with a kick-off party the preceding Thursday evening to be attended by media, industry and pros, including three-time IRONMAN World Champion Craig Alexander. Alexander himself has used TrainingPeaks to track, analyze and plan his training since 2010. “TrainingPeaks is at the leading edge of science and training, and I have found nothing else compares,” said Alexander. Along with the kick-off event Thursday, TrainingPeaks will be exhibiting at the St. George expo and performing live, race-day power analysis from the top professional athletes. The full analysis, including infographics and screenshots will be available at TrainingPeaks.com/StGeorge as well as IRONMAN Live. For more information, please visit www.ironman.com and www.trainingpeaks.com. Media inquiries for IRONMAN should be directed to media@ironman.com; media inquiries for TrainingPeaks should be directed to gloria@trainingpeaks.com.